For many dog owners, the evidence speaks for itself. Scratched doors, defiled carpet and the chewed remnants of your favourite mag are some of the more tangible clues you might find on your return. But what's normal and what signals serious stress? Every dog is different, and so too are their responses to being alone, says Bondi-based Dog Behaviourist and Trainer Ian Shivers. Much of their behaviour depends on how well-settled, calm and non-emotive they are around the whole process of being left by their owner. "Often if a dog's happy and relaxed he'll just take himself off to bed when you're about to leave, without even following you to the door," says Shivers. This is a good sign, as Shivers suggests dogs need around 18 hours of sleep a day. "Ideally your dog will be asleep for the majority of the time you're out." "Some people make the mistake of thinking their dog looks sad or depressed when they go and lay down as they're leaving. But usually they're just waiting for you to leave so they can settle." If what you find on your return, however, resembles more of a crime scene than a peaceful retreat, there may be more serious issues at play. Signs of separation anxiety vary from dog to dog, but experts agree there's typically displays of agitated behaviour, such as excessive chewing, clawing, scratching and digging — or all-out destruction. You might find your neighbours are enduring prolonged howling or barking, or — as you prepare to leave — he's jumping up, pacing and panting excessively, or peeing by the front door. Look out for subtle signs too like simple changes in body language or 'behaviour loops' (repeated cycles of activity) in the lead-up to you leaving. Most dogs tend to display several of these behaviours, not just one, says Shivers. So what can you do to improve matters? Providing your dog with ways to keep occupied or soothe anxiety can definitely help. Shivers suggests leaving out comfort toys for your dog to chew and play with — but it's important to ensure that these won't overstimulate your pet. For example, Kongs or treat dispensers are great, but a ball can make some dogs go crazy and might just wire them. Dog behaviourist and author of Dognitive Therapy Laura Vissaritis suggests using high value food to keep your dog interested, rather than everyday kibble that they'd usually get when you're home. "Get a little creative and use paper towel rolls, tissue boxes or even shoe boxes to hide treats in," she suggests. "Provide a dog area in the backyard which has yummy treats buried, to stop them digging in no-go areas." Alternatively, consider doggy daycare or tap up local animal-lovers who might want to get involved with dog-walking. "Remember dogs are intelligent and emotional animals," says Vissaritis. "Their anxiety needs to be acknowledged and so calling out to others for support is a great idea." Build calm associations with the front door. "The front door is often a big point of stimulation for dogs, so the calmer the association, the less stress the dog will carry when you approach it," says Shivers. Carry out basic puppy proofing. Put precious things out of reach and consider using deterrents on anything they might want to chew. Focus on your dog's mental health, as well as physical. 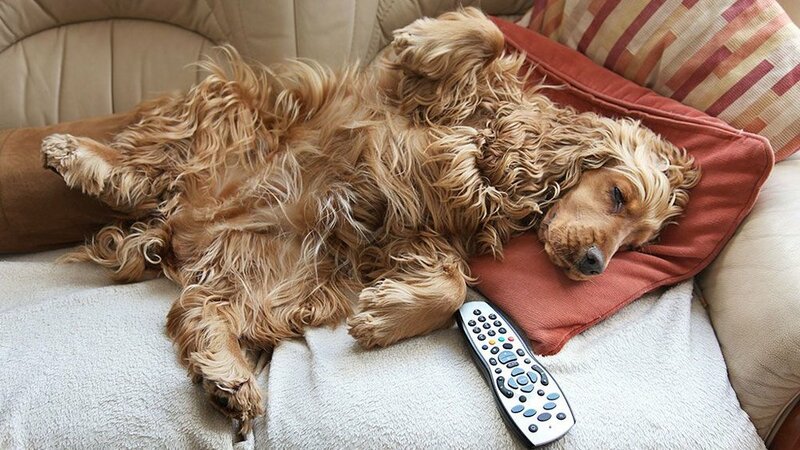 Experts agree that too much emphasis on physical exercise over mental can make dogs more stressed (when exercised to the point of exhaustion!) and do more harm than good. Get them worked up. Avoid creating a highly emotional state in your dog when leaving. "No tricking or distracting your dog by throwing food one way and then running out the door," says Shivers. "This only leaves the dog panicked and in a frantic frame of mind." Likewise, avoid creating anticipation for your return — try to avoid an emotive scenario or over-stimulating them. "If there have been accidents, try not to make too much of a deal of it so as to prevent feelings of stress and fear of reprimand." Expose your dog to external stimulus that can potentially cause stress. "Allowing them to look out of windows and through gates at passers-by is a definite no-no", says Shivers. Close the blinds!